One of the skatepark designs proposed at the May community meeting. The final design meeting for the Jefferson Park Skatepark is next Wednesday, July 14, at the Jefferson Community Center, 3801 Beacon Avenue South. Beacon Mountain Play Area and Jefferson Park Playfield will be discussed from 6:00 to 6:40 pm, then from 6:45 to 8:00 the final schematic design for the skatepark will be presented. Here is a flyer with more information. Meeting notes and concepts from the April and May community meetings may be downloaded here. The project is currently planned to be advertised for bid in early 2011 and completed in late summer of the same year. Did you know that Jefferson Community Center has a pottery studio? Neither did we. Photo by Karpov the Wrecked Train via Creative Commons. Molly Hueffed writes to let us know about adult pottery classes at Jefferson Community Center this spring, meeting on Mondays and Wednesdays during the days, and Mondays, Tuesdays, and Wednesdays in the evening, depending on which classes you take. Classes start on Monday, April 5, and enrollment is open now. You can find and register for classes via this Teachstreet page, or via the Jefferson CC website (go to SPARC registration), or by calling 206-684-7481. The community center is located at 3801 Beacon Avenue South. For more information, see the Southeast Spring brochure. The first of three design meetings for the new Jefferson Park Skatepark, including updates on the Beacon Mountain Play Area and the Jefferson Park Playfield, is scheduled for April 14 from 6:00 – 8:30 pm at the Jefferson Community Center. From 6:00 – 6:40 pm the project manager will provide updates on Beacon Mountain and Jefferson Playfield, then at 6:45 the design workshop will begin for the skatepark. The community is asked to bring their skatepark ideas, images and drawings to share with the design team. 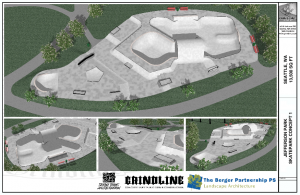 The next meeting on May 26 will refine the skatepark ideas and a final meeting will be held on July 14 to review a final skatepark schematic design. Each meeting will begin with a construction update of the overall park, Beacon Mountain and Jefferson Playfield. 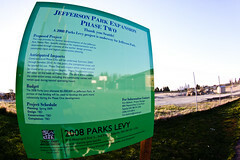 Find more information on the skatepark here, and more information on Jefferson Park here. If you’re closer to Rainier Beach than Jefferson Park, fear not, you also have a great new community center and pool coming soon! All are invited to come and learn about the design of the new Rainier Beach Community Center and Pool at a public meeting at the Rainier Beach Community Center, 8825 Rainier Avenue South, on Tuesday, April 13 from 6:30 – 8:30 pm. For further information, see the project website. Thanks to David Gackenbach, Molly Hueffed, Frederica Merrell, and Heather Dwyer for forwarding us community center/park info! 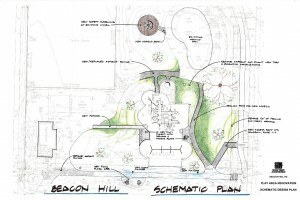 Beacon Hill playground renovation schematic drawing. Click for full-size. View the original PDF from the Parks department. 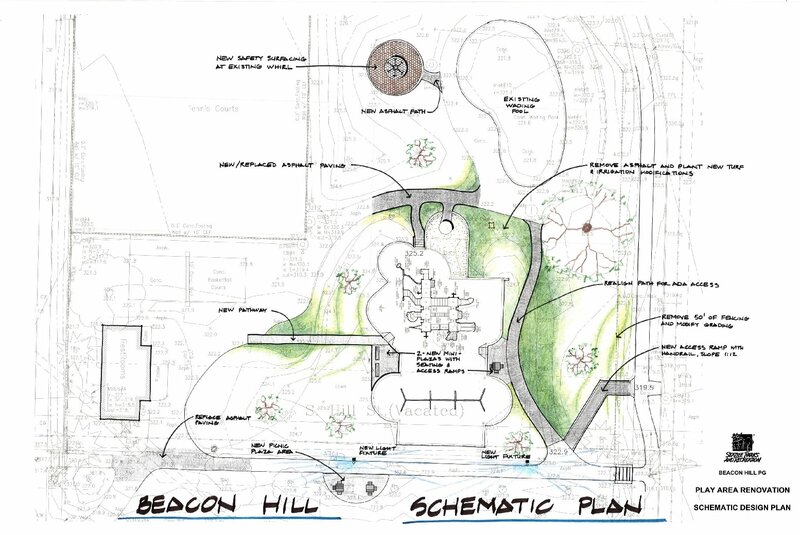 Coming out of a community meeting last month, the Parks Department has made some changes to the Beacon Hill Playground renovation project at Beacon Hill Elementary, funded through the Parks and Green Spaces Levy which is providing $180,000 for planning, design, and construction. The project is expected to be completed by August. Park Planners responded to input from meeting attendees and reconsidered the ramp placement, are removing some fencing and installing more planting, and are adding two pedestrian lights not in the original plan. The meeting minutes including community requests, comments, and priorities expressed are after the break. The minutes are available in their original PDF form on the project web site.